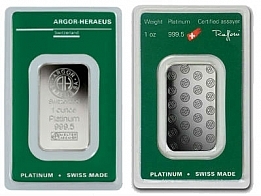 Buy platinum bars made by Argor-Heraeus from SuisseGold.ch. 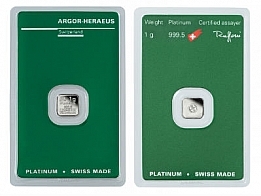 Argor-Heraeus platinum bars are available in different sizes, including 1 Ounce and 100 Gram platinum bars. Multigram platinum bars are also available. 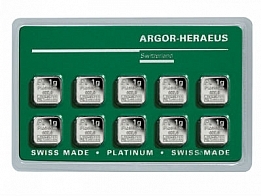 All Argor-Heraeus platinum bars are available for delivery or VAT-free storage in Switzerland.